Nothing is more exciting than a Go Cart. Kids and adults both love to go driving along in a Go Cart. 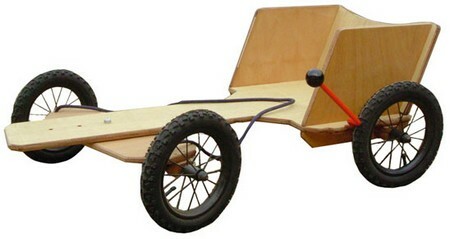 A simple wooden version of a Go Cart is not difficult to do if you have the right parts. You will face a challenge finding an axel and some wheels, but that’s the most hardship you will encounter. Some parts can be salvaged from old carriages, tricycles or other things. 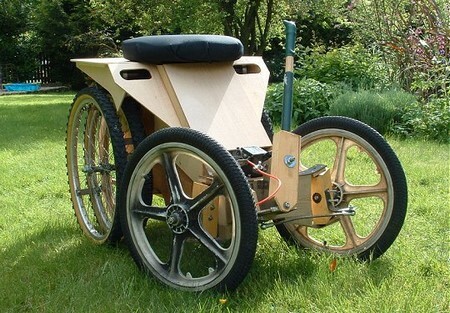 Here is how you can make a wooden Go Cart. Continue reading to find out how. Cut your axles out of wood. You can adjust this. We will use 17 inches of wood. The middle board should measure 3’9”. Sand all the wood pieces. Make them reflect your personality. Have fun. Varnish them Let the wood dru all the way. Join each axle to the short board. Screw two or three electrical saddles to each axel. Use a clamp to secure the long plank to the two axles. The overhand should be identical. Now we are going to place the steering mechanism on. Use a partially threaded bolt. You will need to be able to tighten a nut on the bolt but have the bolt still turn freely in its place. If you need help finding a partially threaded bolt, go to your local hardware store. Measure so that the bolt is centered in the back and front. This stops the Go Cart from pivoting to wither side by itself. Place the rope to both ends of the front axle. Tie a bowline knot on each end. Paint your Go Cart. Use patterns, pictures, acrylic paint on the main parts. Ensure there is sufficient space between the longer board and the wheels of the go cart to accommodate your feet. This will help you steer the Go Cart. Look for parts to use in recycling centers, thrift shops, junk yards, dumps and great places you may salvage useful items to rebuild your go car. You can find xles from older bicycles, wheel and other things from baby carriages, etc. Also, scout these places out for the steering wheel you will need for your go cart. Carpet stores will often let you have left over remnants of carpet and/or vinyl that they are just going to throw out anyway at no cost to you.